Marine Science Institute Director Dr. Robert Dickey issued the following update on damage to the institute from Hurricane Harvey. Following is an update from The University of Texas at Austin Marine Science Institute Director, Dr. Robert Dickey issued Sept. 12 on the institute’s operations in the wake of extensive damage from Hurricane Harvey. The University of Texas at Austin Marine Science Institute (UTMSI) is the oldest marine research facility on the Texas coast. What began humbly in 1941 as a small, lumber shack on the shores of the Gulf of Mexico in Port Aransas is now home to leading-edge research, education, and public outreach programs promoting knowledge and stewardship of our coastal bays, estuaries and oceans. 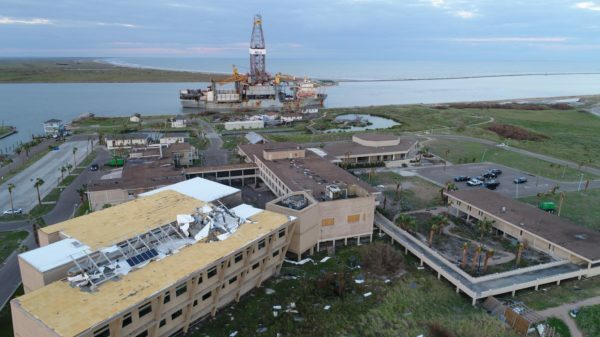 Hurricane Harvey made landfall at Port Aransas on Friday, Aug. 25, and swept northeastward to impact our neighbors from Rockport to Houston, leaving a path of destruction in its wake. The edge of the eye wall passed directly over UTMSI at Port Aransas with Category 4 winds surpassing 136 mph. The most important outcome from the storm is that all of our students, faculty members and staffers are accounted for, safe and healthy. However, the Marine Science Institute sustained significant damage. Most of our roofing failed; our laboratories and offices, including newly constructed labs and offices, were inundated with water; and our student housing was severely damaged. In addition, two days after the storm, a drilling ship that broke its moorings destroyed our research pier and instrument house that had survived the storm. We have a lot of cleanup and rebuilding to do. The storm necessarily halted our research, education and outreach mission, and we will be delayed in restarting until we can re-establish the supporting infrastructure. We are still assessing the full scope of the damage to the institution, and our path forward. Although Harvey has disrupted our programs, our preparations prior to the storm helped immensely to reduce the extent of the damage. Emergency generators provided power to many of our sample freezers and aquaculture tank systems. Our red fish and croaker broodstock survived the storm. These fish are the vital basis of research for a wide variety of projects, from oil spill impacts on marine life to understanding hormone receptors common to fish eggs and human breast and prostate cancer cells, one excellent example of the translational impact of marine science research at UTMSI. UT System Chancellor William McRaven was on site Aug. 31, very soon after the storm, to lay eyes on the damage. The chancellor and UT Austin President Gregory L. Fenves have been fully engaged and extremely supportive in aligning emergency aid and specialized personnel to help with recovery in the immediate aftermath, damage assessments and planning our path for full recovery going forward. President Fenves and Texas A&M University System Chancellor John Sharp were instrumental in arranging the relocation of 80 percent of our faculty, students and staff to Texas A&M University at Corpus Christi (TAMU-CC), which came through Harvey in good shape and stepped up magnificently with a helping hand. Special thanks go out to TAMU-CC President Kelly Quintanilla, Harte Research Institute Executive Director Larry McKinney and other colleagues at TAMU-CC for their generous assistance and hospitality. Beyond Texas, the scientific community has rallied to assist. They have offered to host our students and researchers and to help perform analyses for time-sensitive faculty research and student theses, and they have donated both personal and institutional funds to support students and staff members who have been displaced. We have an enormous amount of work to bring about a semblance of normalcy as we begin our fall semester, which I postponed for two weeks. Our graduate students started their first classes yesterday at the TAMU-CC campus. UTMSI is particularly blessed to have a strong and supportive Advisory Council that immediately rose to the occasion with offers to support our students, staff members and faculty members with emergency funds and individual time and labor if we needed it. I am very grateful to each and every one of our council members for their support, which lifted my spirits and that of our UTMSI family. Many thanks to all who have contributed emergency support to the Marine Science Institute. Your support is heartwarming and encouraging as we move forward. It shows that not only Texas but also Texans, indeed our colleagues across the nation, have big hearts. In crises like this it is important to be resilient and positive, to help one another and above all to keep the vision of coming back stronger and better than before squarely in mind. Together, we will make that happen.